Recently I had a few days free in my diary so took the opportunity to head over to the Outer Hebridean islands of Harris and Lewis to check out various locations which I had previously discussed with my colleague Marcus. Living in Portree on Skye means I only have to drive 20 minutes to Uig where I can catch the ferry over to Tarbert on Harris, which is only a 1 hour 45 minute journey. I arrived mid afternoon on the Friday and headed straight for the western side of Harris where I knew of a campsite that I could use as my base for the first evening. Before that I decided to do a bit of exploring before sunset which was around 22:30. As I drove along the A859, the main road which goes round Harris and up into Lewis I spotted what could be a nice composition looking down on to Seilebost beach, where there were some lovely curves in the sand, and to top it off two couples walking their dogs on the beach. My first main location was Bagh Steinigidh, a small bay which looked like it could work in lots of different conditions and tide heights. When I arrived it was around mid tide with the tide coming in, and there was lots of movement in the water as it came rushing up the beach. I started by taking several shots of just the beach with the tide coming and going with the island of Taransay in the background, however knew I wanted a stronger composition. I walked round for a minute and watched how the tide interacted with the various rocks on the beach. 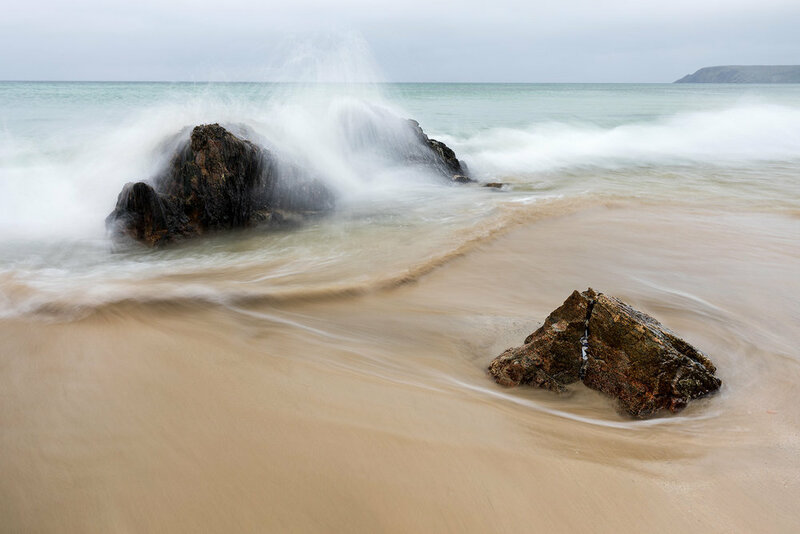 With the shot below I liked how the tide moved around this huge rock structure and knew an exposure time of around one to two seconds would be ideal to capture this. Now, it had been mentioned to me before how much tripods hate Harris and Lewis, in that if you don't come away with the leg sections crunching in some way then you haven't been to the beaches there. Well, within 10 minutes of me capturing images here and as I went to extend the lower sections a bit further, upon closing the twist locks of my Gitzo, all I could hear was the crunching of sand inside. Anyway, I could sort it all out upon my return to Portree where it would be taken apart and cleaned. My next location would be the beach at Seilebost. Now, thankfully I had no pre-visualised images in my head of what I could get from this location, so went in with a clean slate so to speak. As I headed toward the beach the upper dunes were covered in marram grass, so it was a case of finding a suitable composition. It was quite breezy so the grasses were blowing nicely. I wanted to capture that sense of movement so used a Kase 6 stop ND filter to slow down the exposure time. It was then a case of waiting for the light to appear and hit the land how I wanted it to and make the exposure. Down on the beach at Seilebost there are further dunes which have lovely patterns in the sand, and you can probably come here two days in a row and the patterns will most likely be quite different. I found a few compositions I liked, and again it was a case of waiting for the light to come out and cast shadows from the grasses and bring out the colour in the sand. It was starting to get late however I wanted to check out the beach at Luskentyre as I had seen many great images from this location. 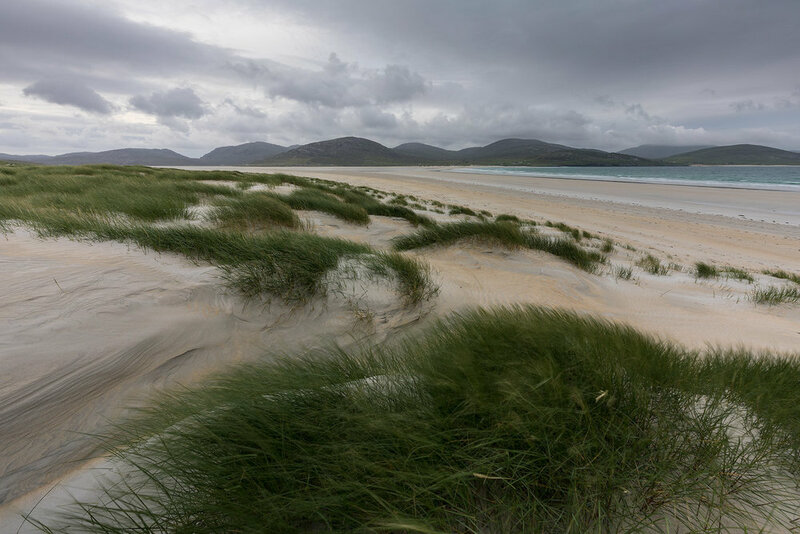 The beach at Luskentyre is vast, however the dunes there are pretty amazing and you could spend many hours exploring them. I didn't get anything that good upon this visit, however I was intending on returning in the morning and explore the area properly; so headed to Horgabost where I would set up camp for the few hours of night before sunrise. The next morning I headed back to Luskentyre, however it was a bit dull and cloudy upon my arrival. I knew there were some white ponies here, however actually thought there was more than two. I was really hoping to find the ponies either down on the beach, or somewhere among the dunes, however they were not far from the main gate after leaving the parking area. I was able to position myself so that this particular pony had the beach showing in the background along with the island of Taransay in the distance. Upon reaching the beach the tide was quite low so I decided to explore the dunes and see what patterns I could find to photograph. After a couple of hours at Luskentyre I decided to head back to the campsite to have some breakfast and take down my tent as I wanted to spend the rest of the day exploring parts of Lewis. My first location on Lewis was the lighthouse at Tiumpan Head. I had never seen photographs from here, so this was more of a scouting trip to see if it could work photographically. Unfortunately the lighthouse was a bit shabby and there wasn't really any compositions I could find up top which would work, so decided to go for a wander down the cliff below. Under the right conditions there are probably shots to be had from here as there is some great rocky shoreline, however the sea has to be agitated enough to warrant taking any photographs, so on this occasion I simply took some record shots. After getting some lunch in Stornoway I headed toward Traigh Ghearadha (Garry Beach). Less than half a mile from Garry Beach you look down on Tràigh Mhòr (Big Beach), which just looks like a large expanse of sandy beach, however I decided to head down and have a look. Here there are some rather high dunes which could potentially produce some nice images, however knowing I had other locations to check out today I headed straight down to the beach. The beach itself wasn't doing much for me, however over to the left it looked like there could be some potential shots amongst various rocks sticking out of the sand. I didn't spend too long here as noticed a bus load of children arriving so knew the beach would be covered in footprints before long. With this I headed back to the car and drove down to Garry Beach. The main feature at this beach are the sea stacks, which at high tide can produce great images. First, I knew I wasn't going to be there at high tide, and secondly, during my visit the winds were coming from the west, and with this beach being on the east it really is a place to visit at sunrise and hopefully along with easterly winds agitating the sea. As the tide wasn't very high upon my arrival I headed through an arch to see what was on the other side. Here there were some nice rocks sticking out of the sand along with nice textured rock faces to frame images with. It was now late afternoon and I had to drive from the eastern side of Lewis, across to the western side to check out the amazing sea stacks at Mangestra, which took over four hours, having stopped again in Stornoway to pick up supplies and stopping off briefly at a couple of locations along the way. The sea stacks are much more impressive in person and I was lucky to have the westerly winds agitate the sea nicely. Unfortunately on this visit there was no sign of an amazing sunset as there was a lot of cloud and no light, so I decided to make my image black and white. After a very long day it was a case of trying to find somewhere to camp near the Calanais Standing Stones, where I wanted to be for sunrise as the forecast was promising. Unfortunately on waking up thirty minutes before sunrise and looking out of my tent the sky was full of cloud and no sign of a break, so I decided to try and get a little more sleep and head to the stones a little later than planned. This was to be my last full day on Harris and Lewis, so after checking out the standing stones I visited the broch at Dun Carloway and the Gearrannan Blackhouse Village before heading up to the natural sea arch at Stac a' Phris. The coastline up here is pretty amazing, however feeling a bit under the weather after having two rather long days and two nights of next to no sleep, I decided to head straight to the arch, which was around a twenty minute walk from where I parked the car. Again, there was no light, however thankfully the sea was agitated nicely to produce some nice texture during long exposure shots. After taking the classic landscape composition I wanted to find a composition which I had not seen before. After walking around for a little while I was struck by the striations in the rock which I could use as nice foreground and lead in lines point to the arch in the background. I spent the rest of the day heading back down to south Harris, checking out Amhuinnsuidhe Castle along the way, visiting the salt flats at Northton and driving round the easter side before returning to Horgabost for my last night. My first experience of Harris and Lewis was amazing, I am just ashamed it has taken me this long to visit, what with being on Skye for the past two and a half years. Hopefully I will be able to return before the end of my 2018 season on Skye or early next year when there will hopefully be some good stormy conditions.